"We would like to extend a personal invitation to you to come join us at Palm Grove. We are a body of Christian Believers who desire to seek God together through discipleship classes, preaching, worship, and prayer. We are dedicated to following the teachings of Jesus Christ. It is our desire to be Biblical in our daily lives and church lives and to be true disciples of Jesus Christ, demonstrating His love to each other and to the world around us. We welcome you to come visit us and see what God is doing at Palm Grove! ​Pastor JR married the love of his life, Mary Ann, in 1986. Their home has been blessed with four children, two daughter-in-laws and two grandchildren. JR was called to the ministry in 2001 and has served as Senior Pastor since 2003. He enjoys preaching God' s Word and ministering to each person God brings into his life. Their prayer is that God would be glorified in their lives and would continue to use them as His instruments of peace. You can follow their family blog at www.together-as1.blogspot.com . Todd and Tonia Webb and their children, Bianca, Nicholas, and Kaitlyn moved to Florida in 2015 not knowing what all God had in mind. They have been actively involved in the work at Palm Grove and in May, 2017 God called Todd to the ministry team. Pete and Wilma came to Florida in June, 1971 as single youths. 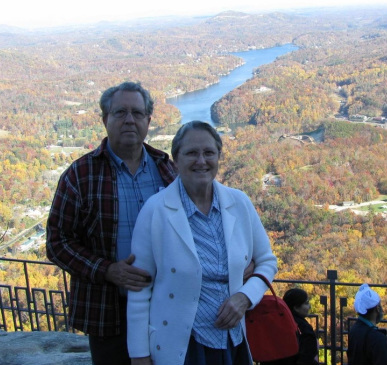 Pete was a student of Eastern Mennonite College and Wilma had finished a year of teaching school in South Carolina. They chose Palm Grove as their home church and were married in December of 1972. After Pete's graduation from EMC in 1974, they returned to Florida and Pete obtained his contractor's license. Pete was called by the church in 1993 to serve on the Pastoral Team. After having raised their daughter and son, and their subsequent marriages (Julie to Ed Overholt and Rocky to Heidi Wesselhoeft) they now enjoy their eight grandchildren, ages 3-11. Pete's passion for the church is that "all would grow in the grace and knowledge of our Lord and know the joy of walking in truth". Wilma's desire is to see the beauty of the Lord in every situation. Al and Irene were married in Ohio, in October, 1971. They moved to Sarasota in September, 1973, and soon thereafter began attending Palm Grove Mennonite Church. Al worked as a carpenter for three years, then bought the business. Irene did housekeeping for 15+ years and helped Al with his office work. They later began serving as elder and office secretary at Palm Grove. Al enjoys antiques and Irene enjoys being a keeper at home and sewing. They both enjoy music, reading, family times, and travel. Their desire for the church is that all would "endeavor to keep the unity of the Spirit in the bond of peace".